The Washington State Convention Center has agreed to provide more than $80 million in public benefits – including affordable housing, cycling and pedestrian improvements and a study of lidding more of Interstate 5 – as part of its planned $1.6 billion expansion in downtown Seattle. The Washington State Convention Center has agreed to provide more than $80 million in public benefits as part of its planned $1.6 billion expansion in downtown Seattle, officials announced Monday. The $82.8 million agreement with a group of organizations calling itself the Community Package Coalition will include $29 million in funding for the city to help create affordable housing, $10 million for improvements to Freeway Park, $10 million for cycling improvements in the Pike Street-Pine Street corridor and $10 million for pedestrian improvements in the corridor, the officials said. Also included: $1.5 million for a study on putting a lid over more of Interstate 5. “Today we’re announcing that this $1.6 billion expansion has the support of a broad coalition of community organizations,” Seattle Mayor Tim Burgess said at a City Hall news conference. The Community Package Coalition, which includes First Hill Improvement Association, Capitol Hill Housing and Seattle Neighborhood Greenways, began negotiating in January with the convention center and its development partner, Pine Street Group. The coalition’s leverage came partly from the convention center’s pending request that Seattle surrender some alleys and property under certain streets. The city requires public benefits in exchange for the transfer and development of rights of way. Burgess called the agreement historic, while Alex Hudson, executive director of the First Hill Improvement Association, noted that the agreement is four times the size of the Pine Street Group’s initial offer. The three-site expansion plan calls for a new meeting center, a residential tower and an officer tower. The convention center is operated by a public-facilities district and with board members appointed by Seattle, King County and the governor. “We took a hard look at what other projects in the city had been doing and what their obligations were” to come up with a public-benefits proposal, Hudson said. Separate from the public-benefits agreement, the convention center will contribute an additional $9.3 million for housing to satisfy Seattle and King County development requirements. Including that money, public benefits will total $92.1 million. 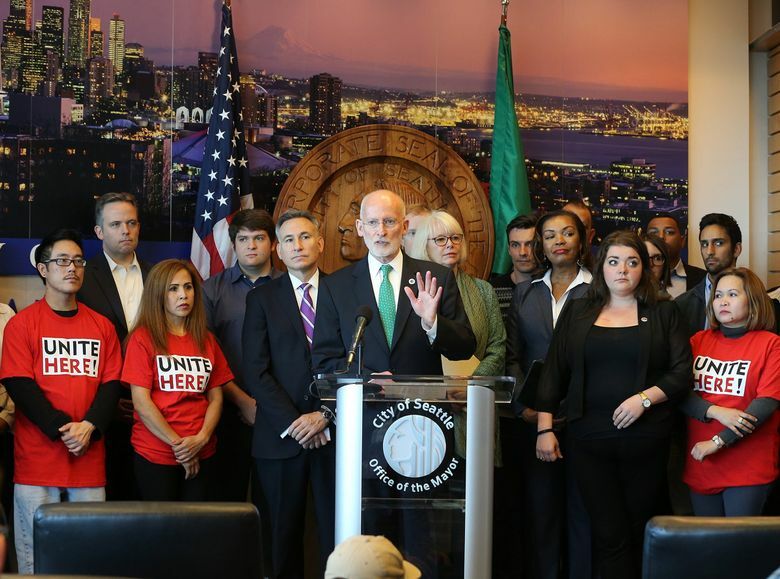 And the convention center will give hotel-workers union UNITE HERE Local 8 the opportunity to train workers for hospitality jobs created as part of the massive, 2.4 million-square-foot project, Seattle Mayor Tim Burgess said during a news conference at City Hall. Burgess on Monday said the project is expected to create nearly 4,000 hospitality jobs. The Seattle Design Commission is vetting the expansion plan, and the City Council likely will consider the alley and street transfers early next year. The convention center is mostly using hotel taxes to pay for its expansion. As much as $200 million in funding for the project is still in question, KUOW has reported. Money from a new state tax on short-term housing rentals, such as those listed through Airbnb, could be dedicated to the convention center. But the state Legislature didn’t pass the tax last session. Asked about that Monday, Burgess said he expects the measure to win approval next year. The county agreed in June to sell its bus station near the convention center to make way for the expansion. The convention center says it needs to double in size to accommodate more business. The expansion has become a point of interest in Seattle’s mayoral race this fall because both candidates have relatives working on it. Cary Moon’s husband, Mark Reddington of LMN Architects, is the lead designer, while Jenny Durkan’s sister, T. Ryan Durkan of Hillis Clark Martin & Peterson, is a land-use lawyer on the project. City law prohibits officials from participating in matters in which immediate family members have financial interests, including spouses and siblings, said Wayne Barnett, executive director of the Seattle Ethics and Elections Commission. If Moon were to become mayor, she would need to recuse herself from any matter directly affecting her husband’s financial interests, Barnett said. And if Durkan were to become mayor, she would need to recuse herself from any matter directly affecting her sister’s financial interests, he said. Usually, when a city official is disqualified from participating in a matter due to a conflict of interest, his or her supervisor handles it instead, Barnett said. But the mayor has no supervisor, he noted, saying he would work with the City Attorney’s Office to determine the best way to handle such a situation if it were to crop up. Moon would recuse the mayor’s office from any negotiations directly involving LMN “because it’s the ethical thing to do,” her spokeswoman, Heather Weiner, said in an email Monday. But the company’s work on the convention-center expansion has already been negotiated, Weiner said. “It’s our understanding that most of the permitting and other day-to-day design issues … are handled inside city departments and by design commissions,” with the mayor’s office not directly involved, the spokeswoman added, saying Moon has consulted with Barnett. Durkan would consult with the ethics commission and the City Attorney’s Office on any potential conflicts and would take appropriate steps when necessary, including recusal, said her spokeswoman, Stephanie Formas.